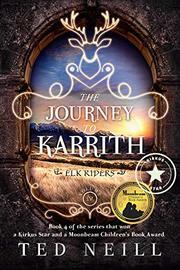 This fourth Elk Riders fantasy novel sees Neill’s (The Font of Jasmeen, 2016, etc.) heroes caught in the war for the land of Anthor. After using the miraculous healing waters from the Font of Jasmeen, Prince Haille Hillbourne, his classmate Katlyn, Capt. Valateen “Val” Mandaly, and swashbuckler Cody Youngblood find themselves hunted in the eastern wilds of Anthor. The High Council of Carasans has hired the dauntless Victor Twenge to eliminate Val and Cody, the last of the Order of Oban. With the prince is Adamantus, a sage elk who helps the foursome survive after they plunge off a bridge and into a river. From there, they head for the majestic but cursed woods of Sidon, hoping to meet Haille’s father, King Talamar, in the realm of Karrith. A prophecy says that Haille will save the king during a battle with marauding tribes. On the way, the heroes find the farmhouse of legendary swordsmith Pathus Sumberland. He gives the prince a blade called Elk Heart, which proves essential to survival in the steamy, exotic world of Sidon. The group eventually runs into a cadre of foul creatures called Vaurgs, who’ve captured a wily young woman who isn’t what she seems. In this installment, Neill leans on numerous fantasy tropes in apparent homage to towering genre figures such as Lord Dunsany and J.R.R. Tolkien. That said, even seasoned genre fans may feel like Sidon is their first passage through an enchanted wood, as Neill’s prose is stately and hypnotic, telling readers, for instance, that the heroes hear “Clicks, songs, even throbbing, which was something like distant thunder, but with the regularity of a fading heartbeat.” But like Sidon, where “Emotion was the most powerful current,” this narrative is strongest when examining the movements of love, no matter how swift or hesitant they may be; Haille’s connection with Veolin Crossborn, the scarred elf girl, is achingly portrayed. Readers also revisit Gail, formerly the villainous Avenger Red, who struggles to atone for her past. This penultimate chapter of the series offers nobility and disaster, as Neill’s fans have come to expect. Another unique, stakes-raising entry in a formidable saga.